Fun fact: Andres' first ever remix was done for NDATL. Almost a decade later, he finally returns to Kai Alce's imprint with an EP of his own. 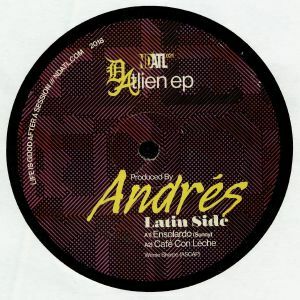 It's a pleasingly musically rich affair, with the Motor City producer using the A-side to explore his Latin roots and influences. Opener "Ensolardo" is probably best described as "organic Brazilian house", with breezy, jazz-funk style backing vocals and lilting synth lines riding a densely layered rhythm track. Andres goes even more percussion-heavy on the track that follows, "Cafe Con Leche", which sounds like the accompaniment to a particularly celebratory carnival party in Rio. Over on side B, "D Town Connection" is a warm, synth-heavy chunk of attractive Motor City deep house, while "I Can't Hear You" recalls the producer's sample-heavy breakthrough releases.